WASHINGTON — On Dec. 7, 1987, Der­rick But­ler raised his right hand and swore to sup­port and defend the Con­sti­tu­tion of the Unit­ed States against all ene­mies, for­eign and domes­tic, as a Unit­ed States Marine. More than a decade lat­er, on July 6, 1999, he swore the oath a sec­ond time. Marine Corps Staff Sgt. Der­rick But­ler, who had a gap of almost 12 years between his first and sec­ond enlist­ments in the Corps, is a con­struc­tion wire­man sta­tioned at Marine Corps Base Camp Smed­ley D. But­ler, based on Oki­nawa, a pre­fec­ture of Japan. Work­ing as a cook through­out his first enlist­ment, But­ler was unable to re-enlist at the end of his con­tract and left the Corps as a cor­po­ral. He moved to Mis­souri, where he worked at a man­u­fac­tur­ing and export­ing fac­to­ry. When the fac­to­ry closed its doors in 1999, he re-enlist­ed in the Corps. 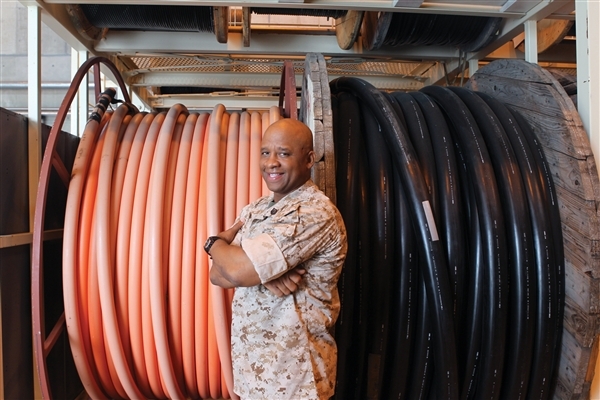 The Marine Corps he returned to had under­gone major changes since the late 1980s, but But­ler, now a staff sergeant, said his love of cama­raderie in the mil­i­tary has not changed. “The Corps is still near and dear to my heart, no mat­ter how much it has changed,” said But­ler, who now serves as a con­struc­tion wire­man at Marine Corps Base Camp Smed­ley D. But­ler on Oki­nawa, a pre­fec­ture of Japan. “No chal­lenge I have faced since my return has been too over­whelm­ing to face. I just adapt and over­come,” But­ler said. Butler’s com­rades are glad he’s back. But­ler plans to retire in five years and said he hopes to pick up pro­mo­tion to gun­nery sergeant before that time comes. For young Marines who strug­gle with or expe­ri­ence regret over their deci­sion to join, But­ler shared some words of advice.